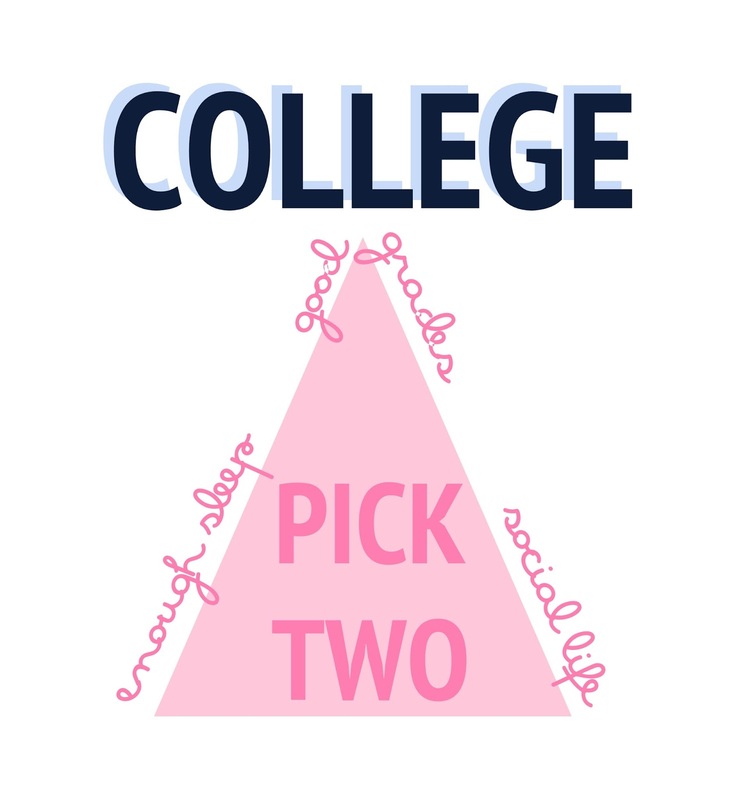 Have you ever seen the triangle describing college that has sleep, social life, and good grades on each of the points that instructs you to pick two? Honestly that triangle is sort of true. You don’t have to pick two and stick to that selection the entire time but in a way, it’s pretty accurate. If I had to sum up which two I consistently picked it would have been a social life and good grades. My social life included the typical college outings but also serving as president and being overly involved in my sorority, Kappa Delta. So, what fell to the wayside? Sleep. Always sleep. Freshman year I was pretty good about sticking to a bed time and getting enough sleep but that’s when I had the least amount of responsibility on my plate. I think back about freshman year and wonder how I was able to waste so much free time. Junior year was when sleep wasn’t even a choice I’d consider on my own personal triangle. 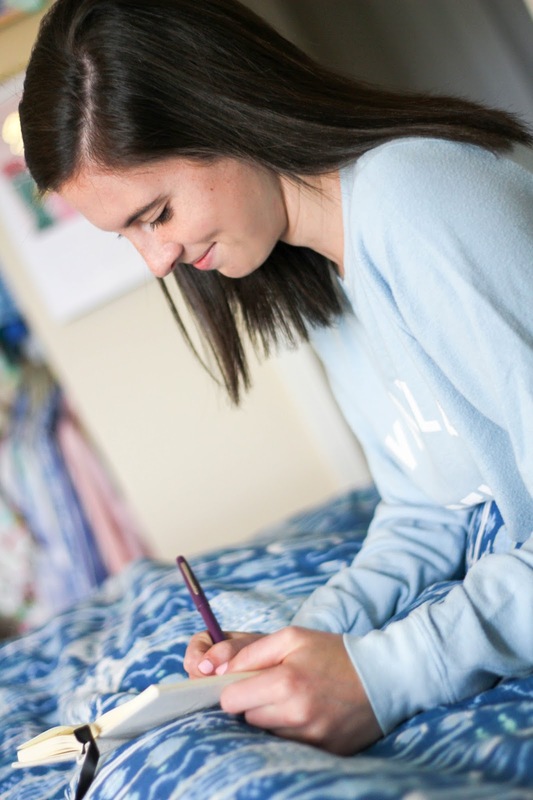 I was taking some of my hardest classes, was in charge of my sorority, had way too many meetings to count, was trying my best to keep up with Prep In Your Step, and was trying way too hard to do everything “perfectly.” I developed this really odd stress rash and had determined that as long as I was getting 4 hours of sleep (fondly referred to as the “core four”) I’d be ready to function the next day. I do have to note that although I was stressed and exhausted, junior year was a lot of fun. So much so that I delayed leaving to head home for summer twice at the end of the school year. One moment in particular stands out when I really failed at trying to juggle it all. We had initiation two nights one week (which I was in charge of), I had a crazy school week, and I had to finish a cooler to take to a fraternity formal that weekend. I had made what seemed like my hundredth trip to our sorority’s storage unit for ritual supplies for initiation when I realized that some of the things used needed to be steamed. Attempting to be efficient, I hung everything in our small apartment bathroom and turned the shower on full heat and closed the door. I had balanced everything with bags of Epsom salt so that the wrinkles would fall out. Well, my trick worked until I took the items down and left our apartment bathroom covered in lavender Epsom salts. With little time, I rushed off to initiation with my freshly steamed supplies, Epsom salt everywhere, and a painted cooler in our bathroom that still needed to be sealed. I ended up having to seal the cooler the day we were leaving and the way the guys put them in the car left the cooler I painted pulling off some of the meticulously painted design on the other cooler because it was still tacky. I wish I could say that was just a really off week but honestly that’s what a lot of junior year looked like. Don’t worry, I cleaned up the Epsom salt about a week later (Thanks for always being patient with me Sophia! Not sure how I got you to agree to live with me again senior year after this incident). Looking back now, this is all hysterical. So, where am I going with this? The core four was really not as efficient as I once believed it to be. Fortunately, now I am SO much better about getting enough sleep. When Ellison asked me what the core four was, I wanted to hug her just for not knowing about this phase of college. With teaching, I don’t have much of a choice to be up and ready early in the morning which means that I have to be in bed asleep at a decent hour. Since this was definitely an adjustment, I’ve discovered some different things I can do in order to be better about my bedtime. I’ve included my best tips below. I would drink coffee all day if I knew that it wouldn’t be terrible for my health. It’s comforting, delicious, and gives me energy for my day. Unfortunately, I don’t need a ton of energy in the afternoon if I’m going to do my best to be asleep at a certain time. With graduate classes at night, it can be SO tempting to grab a cup of coffee on the way to my class at 5:45. I do my best not to drink coffee after 4:00 so that it in no way impacts me attempting to fall asleep. I know that coffee doesn’t affect everyone and in reality, I can fall asleep after a cup within an hour of bedtime but when I’m trying to be good about my bedtime, it’s for the best that I avoid it. If I’m really desperate for some coffee in class I make sure to grab decaf. I never really used this setting until January but it is a great reminder to start winding down at night. My phone goes off at 8:30 to tell me to get in bed by 9:00 (which rarely happens). I am usually not that on top of things to go to bed when my phone reminds me but it does encourage me to finish up what I’m working on and prioritize before bed time. Again, I may not always succeed with this, but trying to have my teeth brushed and be in bed by 9:30 helps me to keep in mind how much time I have left to do things before bed. Usually I’m a bit closer to 9:40 but once I’m in bed I should be completely ready to turn out the light and fall asleep without having to get back up. This may be the BEST thing I’ve done to help with actually going to bed at a decent hour. 10:00 is when I try to have my lights out and my nighttime routine finished. I know I can’t be the only one who can fall into the trap of scrolling through my phone and realizing an hour later that I’ve wasted so much time. I am pretty strict about having my alarm set and my phone face down by 10:00 so that this does not impact what time I fall asleep. 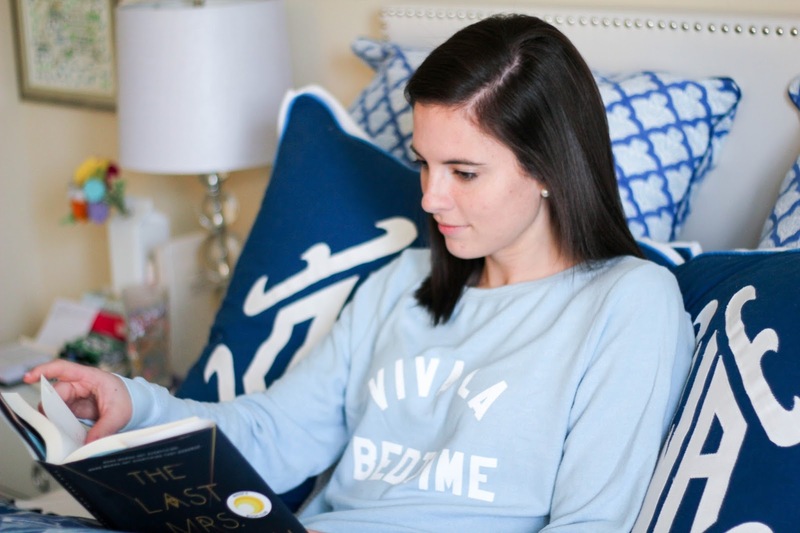 Another big change I’ve made to be better about my bedtime is taking some time to read a book before bed. This has been a great way to wind down and attempt to turn off my thoughts before bed. Usually, I’ll get through about a chapter before setting my book down and turning off my light. If you’re looking for any book recommendations, be sure to scroll through the posts under “book recommendations” for a number of good picks. I’d love to know if there is anything specific that you do to help stick to your own bedtime. While I still don’t consistently get 8 hours (I get closer to 7), this is a big improvement from how my sleep habits used to be. 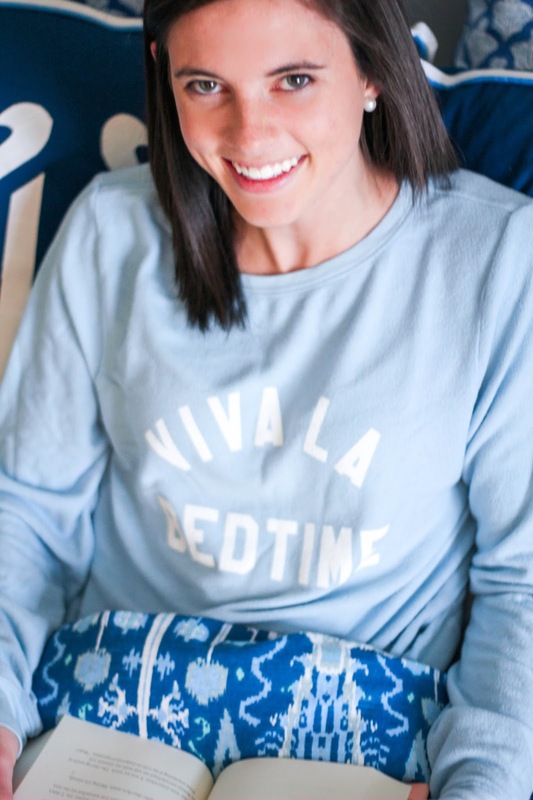 Also, on a semi related note, this sweatshirt is currently a part of the big sale Shopbop is hosting. If you haven't heard of it yet don't worry since the sale won't end until the 14th. With that said, if you see something you want I'd snag it while it is in stock. For purchases under $500 you'll receive 20% off and those over $500 will receive 25% off. Since this gave me an excuse to browse the site I decided it would only be fair for me to share some of the best finds with you. Here are my favorites. Ooh, definitely going to have to take up some of your tips, Dorothy. I'm horrible with my bed times - I often find myself heading off to sleep as late as 4am. It's a very bad habit! Love this! I can 100% relate to the pick two philosophy. Definitely need this in my first semester post grad.